Australian Foreign Minister, Stephen Smith: "Serious unanswered questions"
Four Rio Tinto executives have been found guilty of bribery and stealing secrets by a Chinese court and have all been handed lengthy jail terms. Australian Stern Hu was handed a 10-year sentence. Wang Yong was given 14 years, Liu Caikui seven years and Ge Minqiang eight years. The four colleagues were also fined and had assets confiscated. Australia's Foreign Minister Stephen Smith described Hu's sentence as "very tough". Mr Smith also criticised the court for not allowing Australian diplomats access to the parts of the hearing dealing with the commercial espionage charges. "As a consequence I think there were serious unanswered questions on that part of the trial," he said. Journalists were allowed to watch on a video link as the verdicts in this highly-anticipated trial were delivered. We had just a glimpse of the four Rio Tinto executives as they filed in and sat down in silence. The judge reeled off lists of sums he said the four men had received in bribes. He said they had seriously damaged the competitive interests of Chinese steel enterprises, which led China to suspend major price negotiations last year. Many foreign businesses in China are extremely concerned that the secret proceedings of the trial mean they cannot learn the lessons of the Rio Tinto case. There are also suggestions that foreign businesses are looking to divert investments away from China because of what they say is a growing legal and regulatory obstruction designed to protect Chinese companies and shut out foreign competitors. "Whilst we do not condone bribery in any way, I think the sentence, on any measure, is harsh," he said. However, Mr Smith said the verdict and sentencing would not have any adverse effect on Australia's relationship with China. Rio Tinto described its employees' behaviour as "deplorable" and said it had decided to dismiss them. It said it had concluded that the illegal activities were carried out "wholly outside our systems". It has also ordered a second, more in-depth review of its processes and controls. "[We] will spare no effort in doing everything we can to prevent any similar activity," the company said in a statement. Chief executive Tom Albanese said he was "determined" to ensure that the case did not affect the mining firm's "important relationship" with China. Stern Hu was Rio Tinto's lead negotiator in talks with Chinese steel mills to try to settle a price for China to buy iron ore from Australian mining companies. During the trial, the defendants admitted taking bribes, but disputed the amounts of money involved, their lawyers said. According to reports, Hu was charged with accepting bribes of $900,000 ($600,000). Hu was given a seven-year sentence for bribery and five years for commercial secrets theft, reduced to 10 years in total. He also had assets worth 500,000 yuan ($73,000; £49,000) confiscated and was fined the same amount. China has made it absolutely clear that if we want to play on their manor, we play by their rules. And these are not rules that are necessarily consistent with western ideals of fair play and free trade. Wang Yong was given 13 years for bribery and three for secrets theft, reduced to 14 years in jail. He was fined 200,000 yuan and assets worth 5m yuan were confiscated from him. Liu Caikui was given five years for bribery and four for secrets theft, reduced to seven years. He was fined 400,000 yuan and had assets worth 300,000 yuan confiscated. Ge Minqiang was handed a six-year sentence for bribery and three and a half years for secrets theft, reduced to eight in total. He was fined 300,000 yuan and had 500,000 worth of assets confiscated. 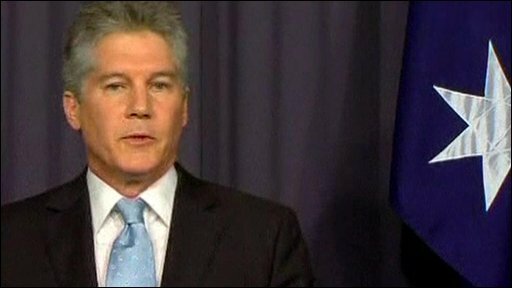 Australia's Consul-General Tom Connor told reporters that all the sentences would be backdated to 5 July 2009 when the four were first arrested. They have been detained ever since. A month before the arrests, Rio Tinto scrapped a proposed investment of $19.5bn from China's state-owned Chinalco in favour of tie-up with BHP Billiton, which angered some in Beijing. However, earlier this month, Rio Tinto signed a deal with Chinalco to develop a massive iron ore mine in Guinea.